The perfect growing medium for all container gardens including hanging baskets, window boxes, patio pots and planters of all sizes. 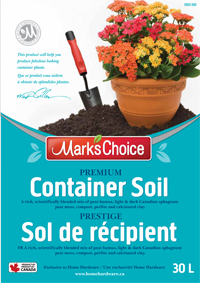 Mark’s Choice Premium Container Soil is a rich blend of peat humus, light & dark Canadian sphagnum peat moss, compost, perlite and calcinated clay. This premium quality product is the perfect mix for container gardening because of its high organic matter content and high water holding capacity.